Spaetzle Party! | Keep It Up, David! Ain’t no party like a spaetzle party ’cause a spaetzle party don’t stop! Spaetzle is cooked, like other pastas, by boiling it. So I started heating a pot of water. 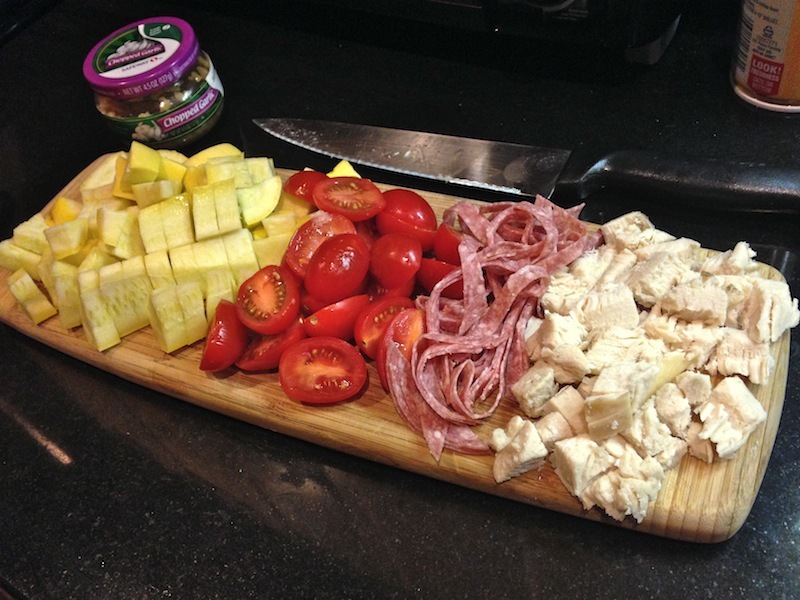 While I waited for it to boil, I did some chopping. I was still staying with my sister in Chicago, and this was a toss-in-whatever’s-in-the-fridge type situation. 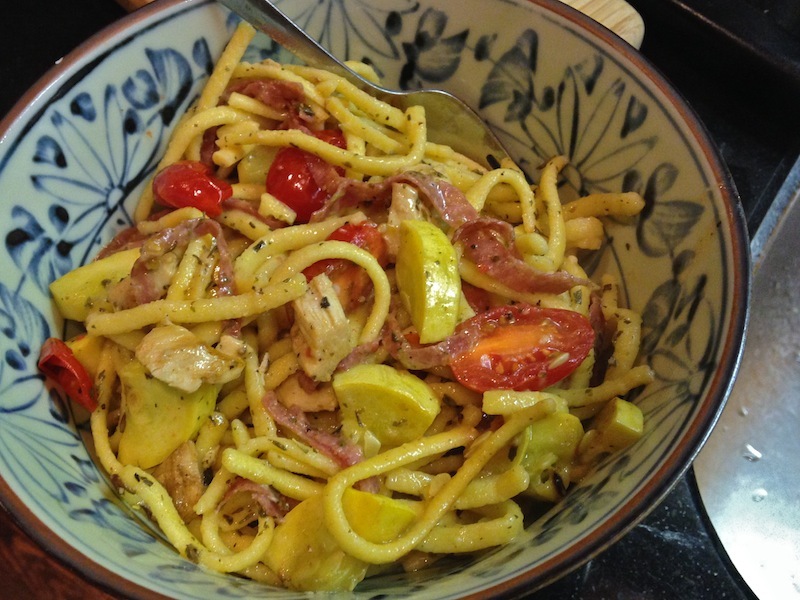 This had one yellow squash, about ten cherry tomatoes (halved), three slices of salami, julienned, and one piece of leftover chicken breast (pre-cooked) – although you can use whatever you have lying around. Once the water started boiling, I threw in some spaetzle. It takes about 12 minutes to cook, and while that was happening, I started sauteing the above ingredients, along with 1 teaspoon of chopped garlic, in a big skillet slicked with butter-flavored Pam. For some added flavor, I added a little black pepper and a generous sprinkling of dried Herbes de Provence to the skillet. The veggies were cooked by the time the spaeztle was finished, so I drained the spaetzle, and added it into the skillet. I also added about 1/2 cup of the pot water, to add some liquid (full disclosure: this was my sister’s idea. “I see them do this on Chopped!”). 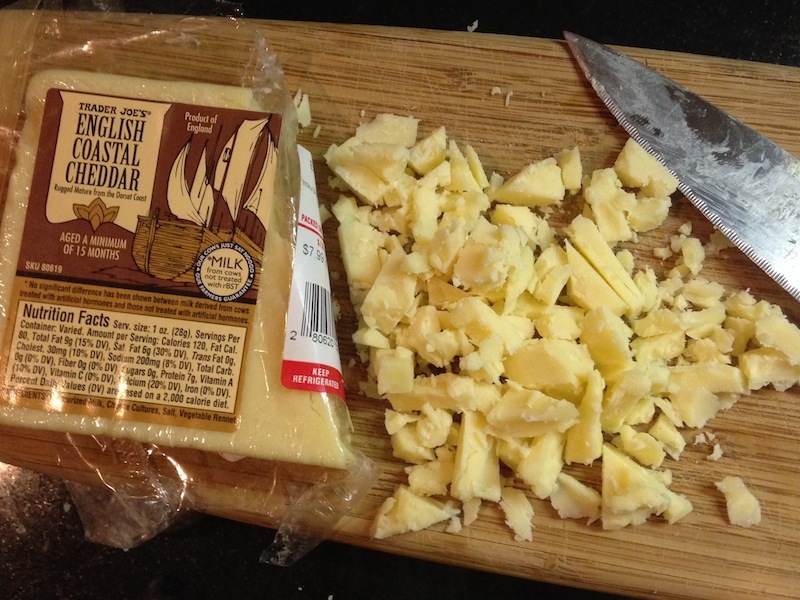 Then I folded everything together, along with about two ounces of crumbled sharp English cheddar. Then I stirred it around a few more times to incorporate the cheese, and then… TIME TO EAT! The spaetzle was soft but still had a little bite. The veggies were fantastic. The little bit of salami added some complexity. The Herbes de Provence brightened everything up. (I gotta get some Herbes de Provence at home!) The whole dish was satisfying. And filling! I should add that spaetzle isn’t a low-calorie food. A serving has 230 calories and 41 grams of carbs. (On the plus side, there’s only 2 grams of fat and hardly any sodium.) In all honesty, I probably ate 3 servings of spaetzle, because this dish was so good. But, like I said at the beginning, this isn’t something I eat very often, and at least this very is healthier than the butter-and-cheese versions in restaurants, thanks to the reduction and elimination of cheese and butter, and the addition of nutrients and protein from the veggies and chicken. It’s a better-for-you alternative, and to quote Martha Stewart, that’s a good thing. This entry was posted on Tuesday, November 11th, 2014 at 12:01 am and is filed under Uncategorized. You can follow any responses to this entry through the RSS 2.0 feed. You can leave a response, or trackback from your own site. 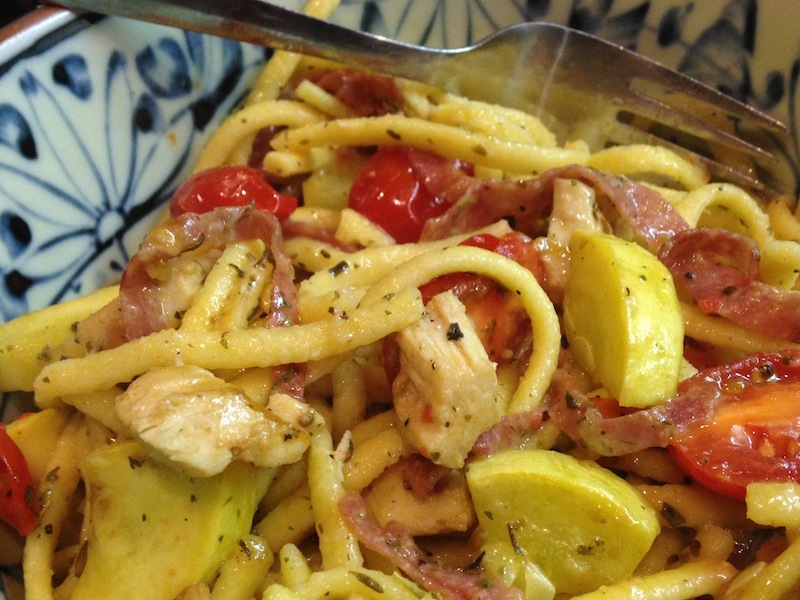 9 Responses to Spaetzle Party! We have a restaurant here called Novak’s. They make homemade spaetzle! Ha! Except that Krueger doesn’t stray from tradition, nor does she really eat veggies, so my version would be unacceptable. She might even be a pickier eater than you, Pat! Your Aunt shops at Aldi! A delightful German owned super market chain, that also owns Trader Joe’s. She sure does! I had never heard about Aldi until last week. 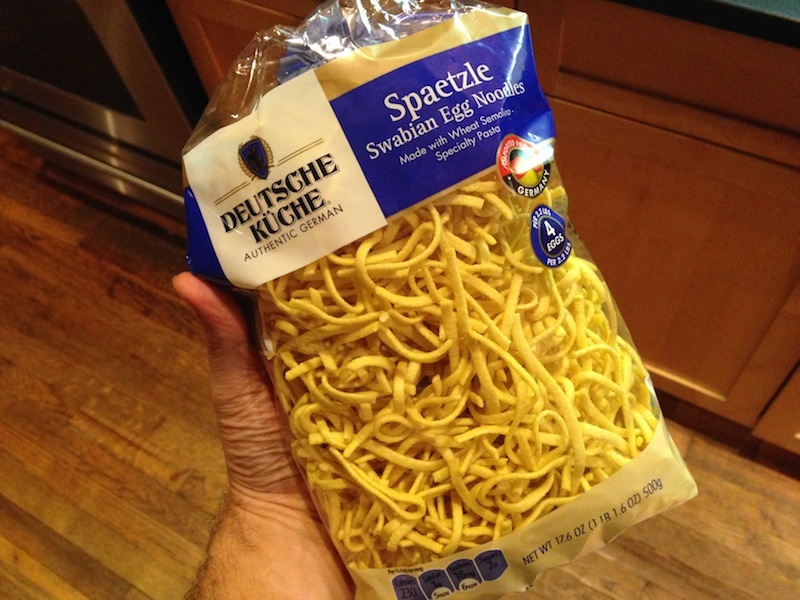 And my aunt says that even at Aldi, packaged spaetzle like that is only available seasonally. How lucky that she gave me the package! Rachel Ray says to always save about 1/2 to 1 cup of the pasta water for your sauce. It serves as a “glue” to hold things together! Your tip for the day compliments of Rachel!